Browse: Home / News / The Celebration Begins! For the next ten days we’re raising money for Retired Racehorse Project with our annual Zenyatta Celebration. 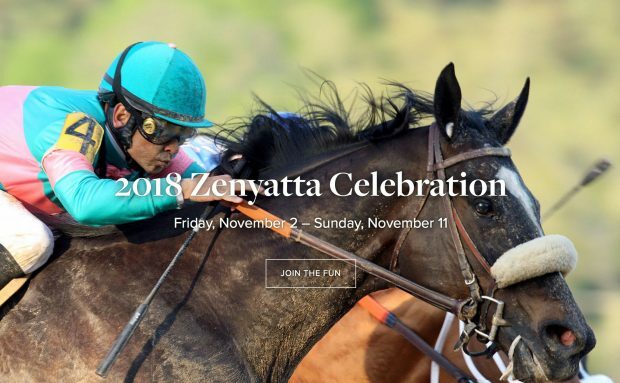 Visit celebration.zenyatta.com for exclusive auction items and opportunities to meet Zenyatta. The 2018 Celebration Sticker is the core of the event, available only at the Zenyatta Shop through Sunday, November 11. 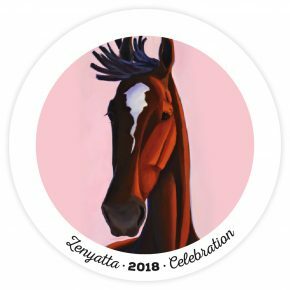 Each sticker purchased is a donation to Retired Racehorse Project plus automatic entry into our grand prize drawing for An Invitation To Meet Zenyatta. Our 2018 auction items include Zenyatta’s halter and shoes as well as the halter and shoes worn by Cozmic One at this year’s Thoroughbred Makeover. Follow our Facebook and Instagram accounts throughout the event—we’ll announce a couple surprises along the way. Plus, voting for our 2018 t-shirt design contest winner will begin next week. A very Happy Birthday to a legend Lester Piggott 83 today. Happy Birthday to Lester Piggott! A legend indeed. Best Wishes, Mr. Piggott. Thanks for the news, Sheena! Super CUTE 2018 Celebration Sticker! I’ll be buying several — And unlike the MegaMillions, this goes to a wonderful cause! Thank you, everybody on Team Z, for putting this Celebration on for all of us every year. Just one more stride would’ve clinched it! She’s all her way home!!! Ballydoyle horses arrived home safely this evening. Read a blurb that said John Sherrifs expects to get Zenny’s baby girl to train. Would love to see her picture and know her name. Nice reading and great photos. Guessing by now, Little Missy has a sleek new coat and is studying hard. Would LOVE to see her new look. Hope she is spunky and full of herself and a quick study. Thanks a bunch for posting this article. I enjoyed the read very much — Pati is an excellent writer. Great photos, too. I noticed one of HardSpun — I have always liked him. Thank you very much! I have a lot more of them (various pictures) on my public Facebook account and twitter but I’m working on updating my galleries on the website too. That was a great article. Z17 is beautiful.!!! A first Melbourne cup for Great Britain as Cross Counter wins for Charlie Appleby and Godolphin.Huge congratulations to all. The aftermath!Rules are there for a reason.Kerrin hit Cross Counter 9 times unlike TS’s 17 strikes in the Classic yet no suspension for Christophe?? A very sad postscript to the Melbourne Cup as Aidan and Team Ballydoyle lose Cliffs of Moher in the race and the Pentagon in training.Much sympathy to Aidan.RIP Bonnie Lads. Oh no — so sorry. RIP Cliffs of Moher and Pentagon. Hovis does’nt want CNS today thank you! Thank you for this! Much needed smiles and giggles courtesy of our boy Hovis. Who needs shoes when you have such fine feathers. Hee-Hee! For those wanting to see a more recent photo of Z17, there is a head shot of her and a turnout companion on Mayberry Farm’s Facebook page. Scroll down to the Oct. 4 posting. Thanks for the photos and info on our little Princess. She sure has mom’s ears. Hope to see and hear more about her come spring. I just have to get this off my chest! I didn’t appreciate Todd on TVG giving Andy Barr free time when the election was so near. Also I didn’t think NBCS did justice to the event. There was no sense of occasion. First time I can recall mike smith not winning a Breeders Cup Race and I no more believe Justify was retired for medical reasons. Just call me grouchy today. I think you’re right. When Justify arrived at Coolmore, Bob Baffert said there’s still time to get him ready for the Breeders Cup. Bought my Sticker and once again Fingers Crossed!! Best of Luck to all The Queen’s Fans! !